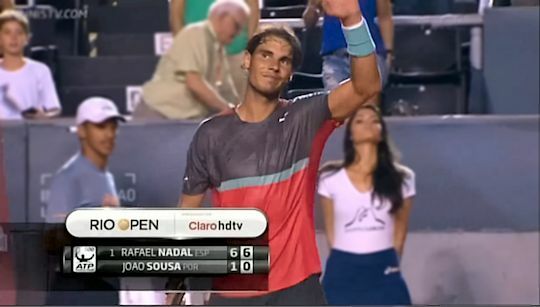 Rafa's first-round match was the 800th in his ATP career. The weather in Rio de Janeiro at this time of year is hot and humid. Humidity rises at night which is when Rafa played this match. That may be why it was tougher than we would have liked. Daniel Gimeno-Traver managed to win more games than in their previous two meetings combined but Rafa still defeated him in straight sets, 6-3, 7-5. It was a lot more relaxing against Albert Montañes. Rafa won in straight sets, 6-1, 6-2 but we have to admit to being more than a little alarmed by the tape across his back. In the quarter final he played Joao Sousa from Portugal (not to be confused with Joao Souza from Brazil however much you may want to). They had practised together earlier in the week which may, or may not, explain why Rafa beat him easily, 6-1, 6-0. We weren't expecting a tough semi-final against Pablo Andujar. Rafa had beaten him with ease last year in the Madrid Masters but maybe the way Andujar had taken Tommy Robredo apart in the previous round should have given us pause for thought. It's hard to tell whether it was Rafa's back, the humidity or the Head tennis balls that made it difficult or Andujar playing the match of his life but it took Rafa three sets and almost three hours before he won, 2-6, 6-3, 7-6(10), to book his spot in the final. Those of a nervous disposition might prefer not to watch the following video of the tiebreak. 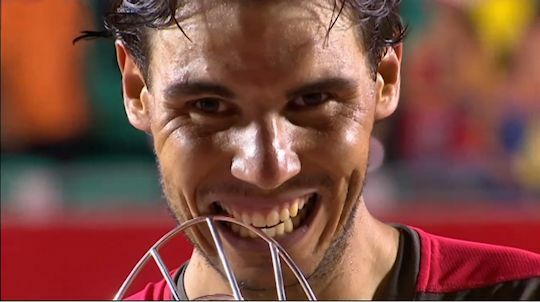 As Rafa put it afterwards, "A little bit of lucky." It did get a bit nasty at the end, however. Dolgopolov, who had never broken Rafa's serve before, chose to break his duck as Rafa was serving for the match at 5-4 in the second. It was a tight moment for this fan as that set went to a tiebreak but we were saved a nervy (for me, at least) third set when Rafa won it and took the match, 6-3, 7-6(3). Here's the trophy ceremony for those people whose coverage decided it wasn't worth showing. That's Rafa's second title of the year and 62nd of his career.